Danish convert to Protestantism; born Nov. 27, 1802, at Stockholm; died at Gladsaxe, near Copenhagen, Feb. 3, 1886. He received his early education from his father, a rabbi, and at the schools of Copenhagen, where in 1818 he became a student of law. In 1823 he became a Protestant and studied theology, passing his examination in 1826. In 1833 he received the degree of Ph.D. From 1827 to 1841 he was teacher at Odensee; in 1842 he visited Spain; and from 1844 was a minister at Gladsaxe and Herloi. 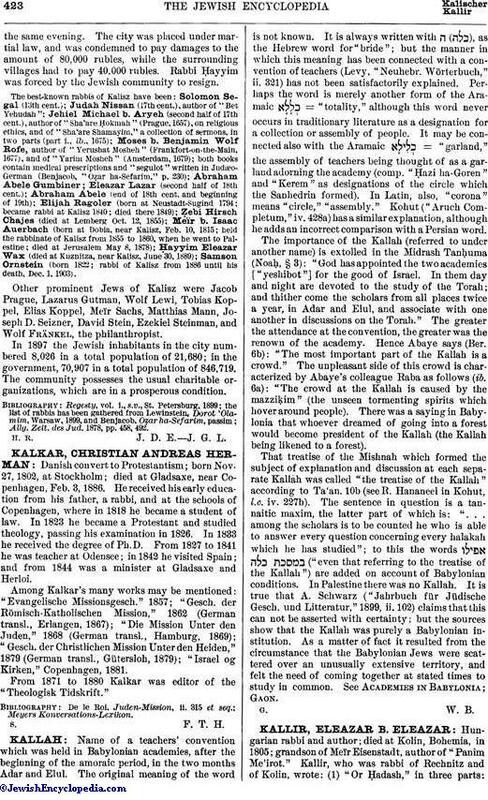 Among Kalkar's many works may be mentioned: "Evangelische Missionsgesch." 1857; "Gesch. der Römisch-Katholischen Mission," 1862 (German transl., Erlangen, 1867); "Die Mission Unter den Juden," 1868 (German transl., Hamburg, 1869); "Gesch. der Christlichen Mission Unter den Heiden," 1879 (German transl., Gütersloh, 1879); "Israel og Kirken," Copenhagen, 1881. From 1871 to 1880 Kalkar was editor of the "Theologisk Tidskrift."